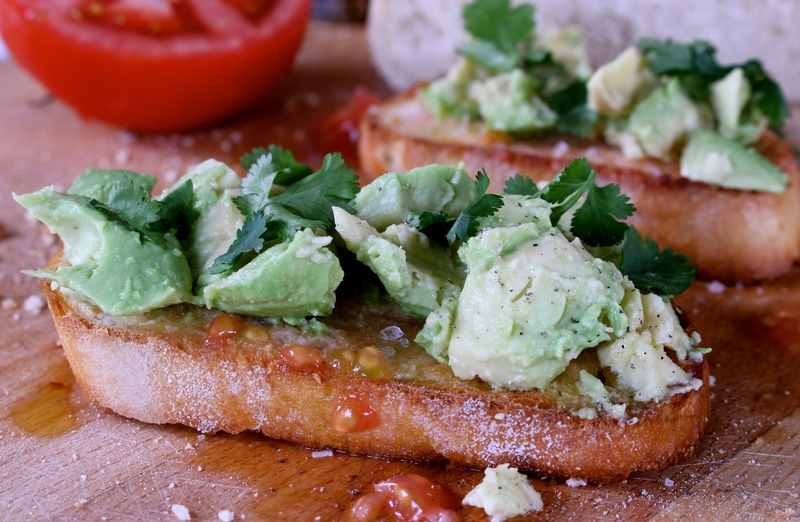 A little something on toast: pan con tomate with avocado | dash.drizzle.dollop.devour. Its nice to sometimes have a slightly summery lunch in the depths of winter, on a day when the sunshine makes a frosty appearance and cuts through the winter gloom. Pan con tomate is one of my staple orders in a tapas bar and whilst it undoubtedly tastes much better in the Spanish sunshine, maybe sat out on a little terrace…with a chilled glass of wine… it can also brighten up a January lunchtime in London. If you’ve not had pan con tomate before, I’ll accept that its not immediately obvious what the magic of a bit of tomato on toast is. It’s one of those simple dishes that is so much more than the sum of its parts. The brief twang of garlic in the background, the grassiness of the olive oil, the crunch of a little sea salt with sweet juicy tomato on top. It’s my favourite thing on toast by a long way. This time I added few chunks of avocado to make it more of a meal, but its not really necessary. You need a robust white bread for this with a good crisp crust – no pre-sliced industrial loaf here please. Grill chunky slices until just golden. Cut a clove of garlic in half and rub the cut side briefly over the crisp bread, just anointing it with a little of its scent. Drizzle over some olive oil, a good quality, full flavoured oil is called for here. Next you need some quite large tomatoes, so they have a decent amount of flesh to them. I find cherry tomatoes are too much pips and skin for this. Rub the cut side of the tomato generously over the bread, giving it a bit of a squeeze as you go. The crispiness from the grill should mash up the flesh a bit and leave a scant layer of pulp and juice over your toast. Add a little extra chopped flesh if you like. A good sprinkle of sea salt plus some roughly mashed avocado and you’re done. Had this for lunch today and loved it.